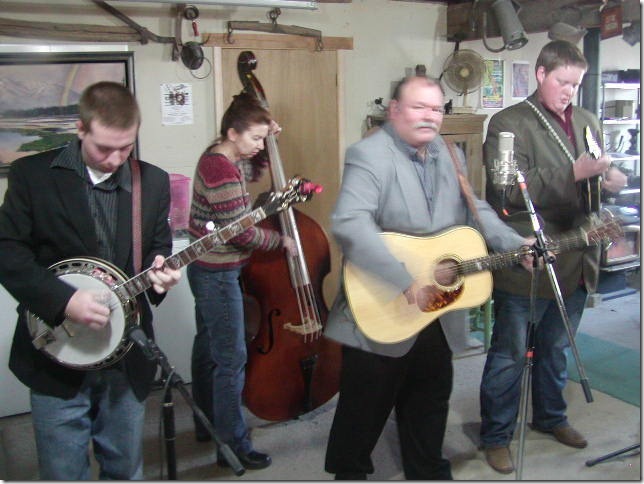 On December 10, Emily Frank and her husband Fred went to Nampa, ID, to play Bluegrass in the Barn with the house band “Tradition”. But this time, there was a little different twist to the weekend. The James King Band was winding down their Western Gospel tour, and James had called Bob Greer, the Barnmaster, to see if he could get them a bass player for their appearance at the Barn. Bob told James there would be no problem, he’d have a great bass player all lined up. 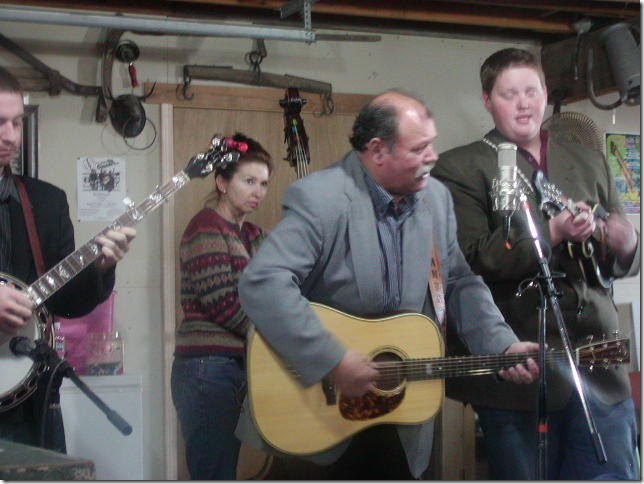 The next day, Sunday, December 11, when Emily and Fred would normally be headed back home, everyone was awaiting the arrival of The James King Band. The band had driven all night to get to Nampa for their Sunday afternoon show, so when they arrived at 6:10 AM, Bob got them settled in to take a much-needed nap. Emily was hoping they would get a chance to practice a little before the show, since she had no idea what tunes they’d be playing. After some sleep and breakfast, the boys unsheathed their instruments to run through a couple of tunes. Emily got out her bass, hoping to be able to “just keep up” with the band. Off to the Barn they went, and when the audience settled in, the band took the stage and proceeded to glide through one gospel tune after another. The music was seamless, with Emily doing a walking bass line in one tune that had the boys smiling at each other in unanimous approval. After an hour of some of the most impressive singing and picking, the show drew to a close. This entry was posted in In the News by fredandemily. Bookmark the permalink. Way to go Emily! You make us proud.